On October 1, 2017, Catalonia held an independence referendum. more than 90 per cent of voters supported the region’s secession from Spain. Since then, uncertainty has prevailed in Barcelona’s real estate market. Uncertainty prevails in Barcelona’s real estate market after the referendum. Many business owners consider Valencia an alternative investment destination. According to Maria Kamysheva, Tranio project manager for property in Spain, Spanish nationals who are looking for property in Barcelona have continued to do so, but foreign investors have turned their attention to Valencia. Other analysts share this opinion. “Previously, if customers hesitated between Barcelona and Valencia, 80% of them eventually chose Barcelona because it has better traffic and is three times larger in size. Now it’s the opposite: 70-80% of customers opt for Valencia”, Juan Luis Herrero from Lucas Fox Company said in an interview with The Financial Times. 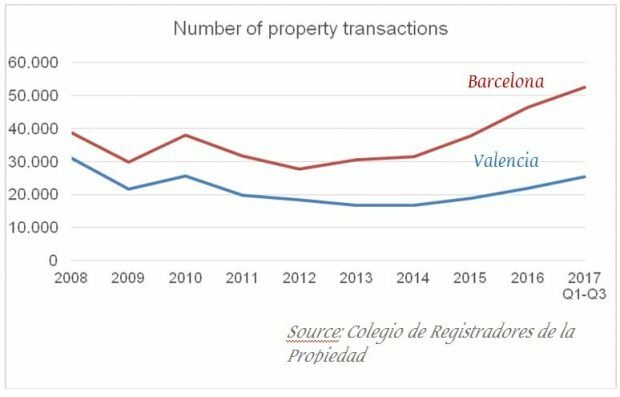 According to the Association of Property Registrars (Colegio de Registradores de la Propiedad), despite the fact that the number of real estate transactions has been increasing in both provinces for the past few years, demand in Valencia is currently growing twice more rapidly. In Q2 2017, the number of transactions rose by 8.25% compared to the beginning of the year versus 3.15% in Barcelona and, in Q3 2017, it grew by 4.12% and 1.35% respectively. 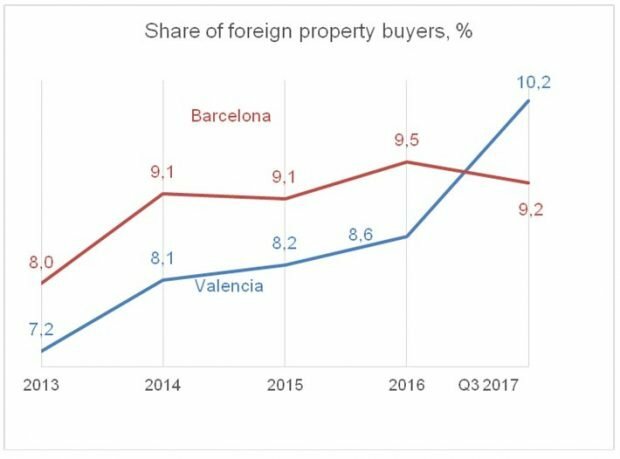 The share of foreign property buyers in Barcelona’s market fell for the first time in five years, from 9.50% in 2016 to 9.24% in Q3 2017. However, in Valencia, this figure has kept on growing, from 8.59% in 2016 to 10.24% in 2017. According to Rightmove, the budgets of residential property buyers in Valencia are more modest than in Barcelona: €64,000 versus €243,000 for apartments and €119,000 versus €573,000 for houses respectively. Prices for property in Valencia are lower than Barcelona. According to Idealista, in Q4 2017, the average price per square metre was €1,668 in Valencia and €4,284 in Barcelona. 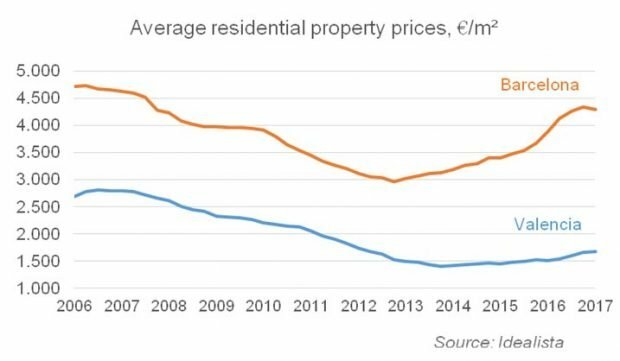 According to Idealista, residential property prices in Valencia peaked in Q2 2007 (€2,802/m²), falling by 50% to a low of €1,400/m² in Q3 2014. By Q4 2017, the price per square metre had grown by 19%. In Barcelona, residential property prices peaked in Q1 2007 (€4,732/m²), dropping by almost 40% to €2,957/m² by Q3 2013. By Q4 2017 prices rose by 45%, approaching pre-crisis levels. “In Valencia, the price surge is not as rapid as in Barcelona, which increases the growth potential”, Ms Kamysheva explained. Valencia is a more favourable market for landlords than Barcelona. Up to four properties can be easily leased there per person. 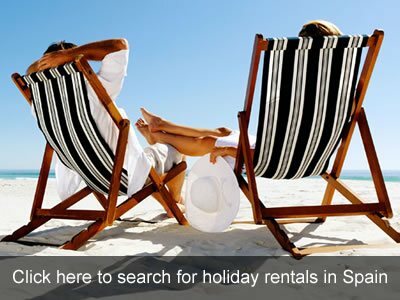 In contrast, only short-term rentals are allowed with a licence in Barcelona, but authorities have stopped issuing such licenses since June 2014. However, according to Airbnb market research firm AirDNA, the average rental rate is twice higher in Barcelona than in Valencia. At the same time, higher yields can be obtained in Valencia due to lower property prices, which are currently 2.5 times more affordable than in Barcelona. This also applies to long-term rentals: an apartment yields about 6% per annum after tax and expenses in Valencia and 5% in Barcelona. Despite Valencia being a less touristy travel destination than Barcelona – it received about 2 million visitors in 2016, compared to 9 million in Barcelona – the number of tourists has been growing by about 5% per annum for the past few years. The city has great potential: there are 313 sunny days a year, and the temperature is above 20 °C for 250 days a year. Two city beaches, Las Arenas and Malvarrosa, are located a 15-minute walk from the city centre, and six wild sandy beaches are within 10 km. In 2016, the International Valencia Airport welcomed almost 3 million passengers. “This is a great alternative to Catalonia’s Costa Brava. In addition, the province of Valencia is greener than Alicante that lies further to the south”, Ms Kamysheva said. The number of hotel bookings in Barcelona as of Q1 2018 is 10% lower compared to the previous year, Exceltur was quoted by The Local as saying. Valencia is probably one of the few Spanish cities to benefit from the referendum results, and property investors have an opportunity to enter the market before prices catch up with the city’s popularity.